The Case Shiller non-seasonally adjusted home price index has now declined for the fourth month in a row (data is an average of December, January and February), but as the chart below shows it is more of a flat line. This type of behavior occurred around this time last year before prices blasted higher through the remainder of the year. Will this occur again in 2014? 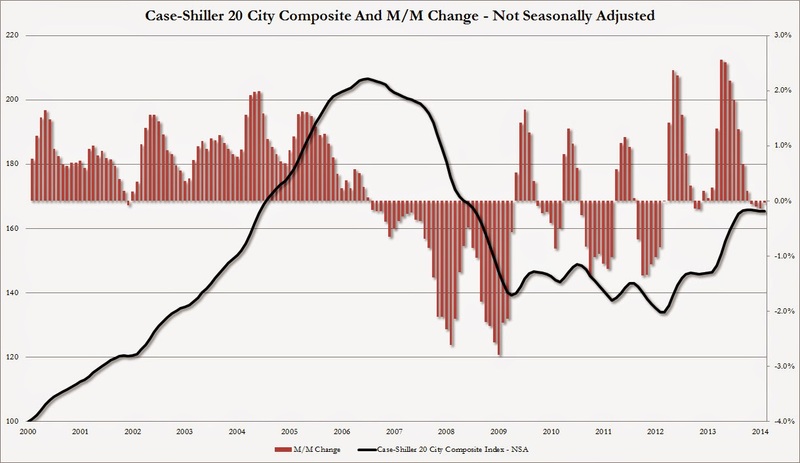 As Shiller discusses below, the picture is less clear due to the horrific stream of housing data we have received over the past few weeks (sales, permits, starts, etc.). The fundamentals behind a housing catalyst are nonexistent. Incomes are flat and home price affordability is falling as interest rates have moved significantly higher over the last 12 months in tandem with prices. The market is counting on a resurgence of demand from institutional investors, which have cut back their purchases drastically.